Thirty-seven per cent of people in Bulgaria could not afford to keep their homes adequately warm, the highest percentage in the European Union, EU statistics agency Eurostat said on January 31, citing figures for 2017. 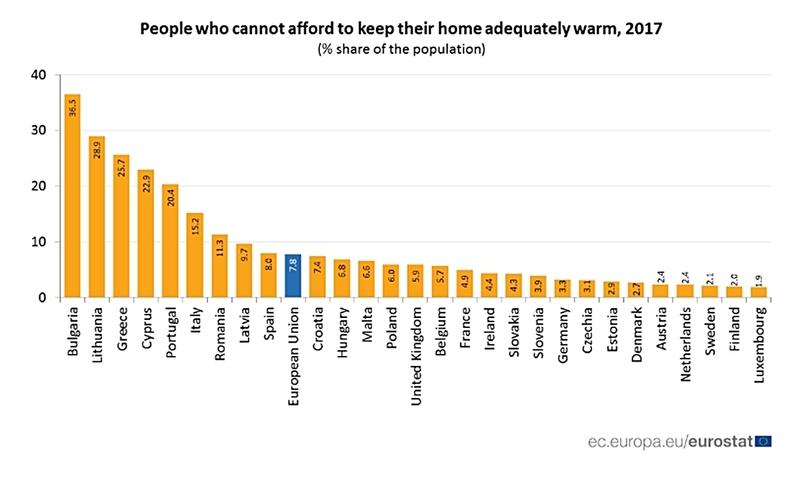 However, the percentages of people in Bulgaria who could not afford to heat their homes has been steadily dropping over the years. In 2016, the figure had 39.2 per cent, while two years before, it was 40.5 per cent, and in 2006, 69.5 per cent, according to Eurostat’s figures. In 2017, eight per cent of the EU population said in an EU-wide survey that they could not afford to heat their home sufficiently. This share peaked in 2012 (11 per cent), and has fallen continuously in subsequent years, Eurostat said. The situation in the EU member states varied. After Bulgaria, the second-highest figure was Lithuania (29 per cent), followed by Greece (26 per cent), Cyprus (23 per cent) and Portugal (20 per cent). In contrast, the lowest shares (close to two per cent) were recorded in Luxembourg, Finland, Sweden, the Netherlands and Austria, Eurostat said.